In several of his well-known paeans to Provence, Peter Mayle describes, both lyrically and at great length, his love affair with the black truffles of that region. Sometimes couched as a cloak-and-dagger chase involving bizarre and nervy rendez-vous’ along dimly-lit back roads, or illicit dealings with “men with dirt under their fingernails and yesterday’s garlic on their breath” in the shady recesses of the village cafe, Mayle often puts himself on the wrong side of the law in search of the prize he calls “the black gold of Provence”. All this is necessary, he maintains, because the price of “rabasses”, as they’re known in Provencale, is so astronomical – an assessment borne out by even the most casual google search (one ounce of black French winter truffles = $106). Thankfully, we were able to pick up some cheaper, black summer truffles (£10 or $16 for two) in a London grocery store the last time we were there. Once he’s managed to obtain said lucre though, Mayle is remarkably restrained in his descriptions of how best to prepare them. Of course, he says, you can stuff a pigeon with them, or combine them with cream and mushrooms as a sauce over beef or veal medallions, but the way to enjoy them at their best, most pungent, earthy and flavorful, is to do as little to them as possible. His preferred recipe is to grate a generous amount of black truffle into and over a simple, loose, French-style omelette, and enjoy with a glass of champagne, for breakfast. Well, since our good friend Nuria at Spanish Recipes challenged us to submit our favorite omelette recipe to her Blog Your Omelet contest, we felt that we had to produce something pretty grand if we were to compete with her amazing range of eggy treats. So, here it is, both simple and sophisticated at the same time, not to mention being about the best breakfast imaginable, especially with the champagne! The key to a good omelet, the great Jacques Pepin reminds us, is to keep it a bit “wet” or “loose” by not overcooking it (which Americans seem to hate, for some reason) and to never complicate the flavor of what should be the star of the show – the egg. Americans know how to do this best – kind of similar to how we can complicate the simplicity of a pizza by weighing it down with a million toppings. Look at the average diner omelet in America – it’s often stuffed with a lot of veggies and/or meat and oozing with cheese – perhaps the only way of saving the old diet “egg white omelet” from being boring and tasteless, however. Regardless of how you usually make your omelet, and whether or not you have truffles, we urge you to try a simple and loose one next time. For ours we simply added butter to the warm pan and poured in our whisked egg and dash of cream, salt and pepper mixture. Stir or whisk the egg while it’s cooking in the warm pan until it begins to come together. Then, stop stirring and let it sit and cook. When it looks mostly cooked but still nicely moist and with a bit of looseness on the top layer, you’re done. (Remember, eggs continue to cook in their own heat, so you can undercook it and it should still be good within a minute or so.) If you so choose to, add some chopped chives and sliced mushrooms sauteed in some truffle oil (if you’ve got it) to the middle and then slice some black truffle (again, if you’ve got it) on top. No ketchup or hot sauce necessary, we promise. OOH! Where in London did you get the truffles from by the way? surprisingly it was in waitrose in putney… they are summer truffles and we’ve bought the same kind before in bologna. they do the trick! This looks like a winner. Very well done. I don’t have truffles around here. You turn a humble omelette into a sophisticated five stars meal. Delicious! I’ll eat that omelet, hold the eggs! How absolutely decadent! This is such a wonderful juxtaposition of simple and elegant. I was summonsed through the power of the truffle – this IS the breakfast of champions! Oh la la. That is decadent. Aaaahhhh, what a delicious entry for the contest!!! Thanks so much guys :D. You do know how to take care of yourselves!!!! I think you made a superb tortilla… truffles are so expensive here too! The simple combination makes this dish a Champion too. Lovely pictures! Oh wow, I would love to try this, it looks so luxurious! This looks so amazing my mouth is watering, thanks for sharing this great dish with us. Something totally different. Oh gosh, here’s my champagne flute, here’s my empty plate, hit me with those breakfast goods! I always forget to drizzle some truffle oil on my scrambled in the a.m. It is hiding in the closet. You had better keep those gorgeous funghi in the safe deposit box! Jealous I can’t even find truffles around here without paying redicilious prices. Plain eggs I go for the hot sauce and ketchup makes me shiver in pain on eggs. However, something like this no freaking way nothing is touching it. Oh yeah thanks for the reminder I keep forgetting I have truffle oil and truffles love eggs. Wow that’s one decadent omelet! Were these preserved in oil? hey marc! had a blast last night – so tired though! the truffles are actually preserved in “truffle juice” and are sealed in a glass jar. they go off after a few months… truffle juice, yum. Hot-damn, that’s a lot of truffle on that omelet! Can hardly imagine how good it was….mmm…. 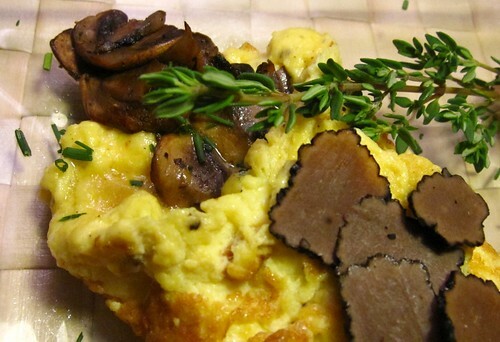 I’ve made scrambled eggs with truffles before so I know how delicious this combination is! I love those big truffle slices on the omelet! Excellent! Be still my heart…oh this is perfection. 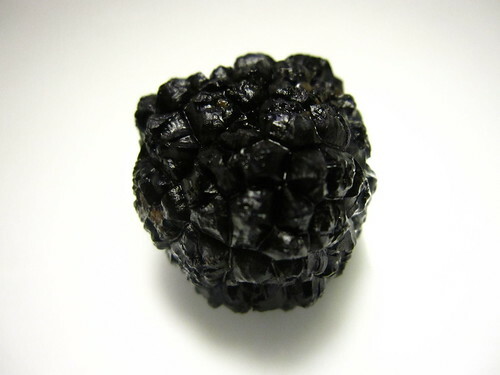 Whenever I look at a photo of a truffle, I wonder to myself, “Who was the first person to actually look at that and decide to eat it?” It’s no beauty. It wouldn’t win any beauty contest and hardly invites people to eat it. Did someone eat it on a dare? Was someone just really hungry? What made someone try it and thus make it into one of hte most sought-after and expensive treats in the world? I’m a TERRIBLE omelet maker. I can never get it just right and holding together. Good breakfast, fit for a king I’d say. Waitrose in putney…who would of thought it. simple and loose when it comes to Omelettes . I couldn’t agree more. Rachel(S[d]OC) – whoever it was should be beatified as the patron saint of deliciousness. and, you’re right, omelets aren’t easy, which is odd because they should be, right? still, here’s a reason to practice for that happy day you get hold of some truffles, eh? Rachel – it’s terribly prosaic, isn’t it? – sourcing truffles at a supermarket in Putney… it would be so much a better story if we’d have bought them at a market in the Perigord or in muddy clearing in the woods outside Alba… ho-hum, they were still delicious and that’s the main thing! I have a stomach of iron…but am allergic to truffles! Imagine that…. You two should have coined this the “bourgoisie omelet”…no one will complain about your generous shavings of this earthy delight. Truffles and eggs — a match made in heaven. Great post. So true about a ‘wet’ omelet vs ‘dry,’ the experience is so much better when it is not cooked to within an inch of its life. My trick for perfectly moist omelets (that are still cooked through) is to whisk grated butter into the egg right before it goes into the pan. I keep butter in the freezer, and just grate it right in with a cheese grater. The tiny shreds of butter melt in an even distribution and make the most tender, most delicious omelets ever. And I totally agree that the best way to enjoy a decadent ingredient is on its own. Now, that’s a luxurious breakfast! This omelet looks INCREDIBLE. When can I come over? The truffles are gorgeous and mouthwatering. A breakfast of champions, indeed! I have an obsession with Peter Mayle… and with truffles, for that matter. I remember reading about a truffle omelette in A Year in Provence that had me drooling on my paperback… and yours looks just as incredible! That is not a bad price for truffles at all. 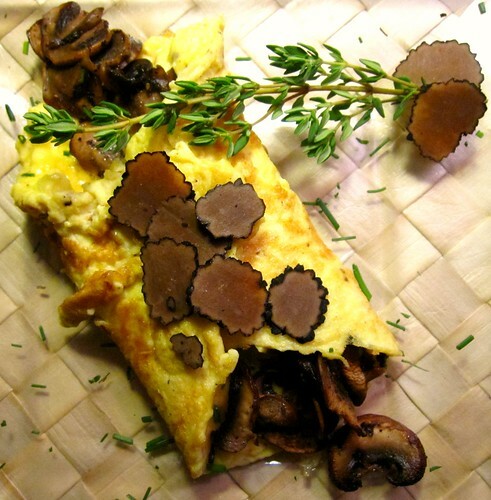 The amount of truffles on that omelet is making my head spin. I have never forgotten the cooking show episode where Jacque Pepin whips up an omelet – I was memorized! He made it look so simple (well, he makes everything look simple) and I could not believe how super-duper fluffy it was. It was a thing of culinary beauty. Pingback: We Are Never Full » Blog Archive » Sigh, Another Truffle Recipe? Ravioli with Walnut Truffle Cream Sauce. If I had to pick out a last meal it would be this omelet. I love omelet! This one looks so delicious. ← Homemade Stuffed Pasta: Yes We Can!